WLS-TV, the ABC O&O in Chicago, has rebranded its weather segments as “First Alert Weather,” following in the footsteps of the station’s main news branding change. The change reflects what may be a continuing effort to make the station’s news and weather products stand out better in a sea of generic and “mandate” style branding in Chicago. The station began sporting new “First Alert” branded graphics recently, which feature bold red letters, but no modifications reflecting the new name have been made to the station’s weather set. 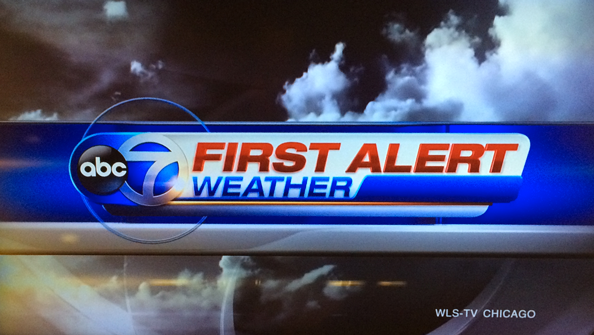 WLS-TV is also airing new weather-themed image campaigns to reflect the new name. The station also didn’t make any changes to its streetside studio set after switching back to “Eyewitness News” — and remnants of the old graphics package remain in the set’s headers and duras. In a related observation, WLS-TV also has’t changed the typeface on its State Street studio’s ticker to match the new graphics package. The station did a great job of using consistent typography from its graphics package on the large LED ticker and even signage found around the studio warning passerby that the area is under video surveillance.